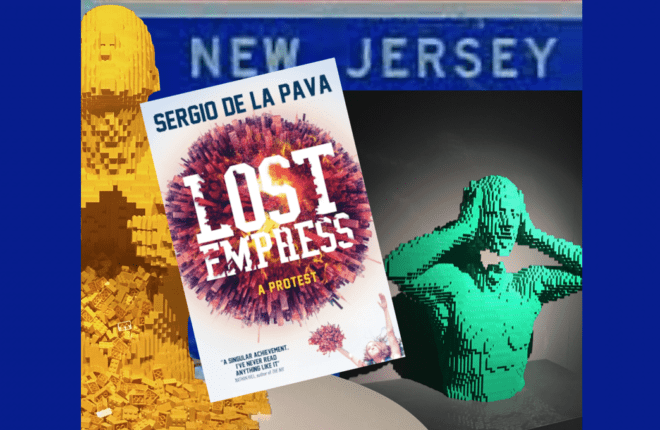 Lost Empress by Sergio de la Pava, novel set in New Jersey. When the feisty Nina Gill takes on the challenge of besting her brother with New Jersey’s Indoor Football League, she has no idea that her appointed deputy, Dia, has a boyfriend bent on breaking out of Rikers Island prison. Lost Empress is a protest novel at every turn. Through the lives of a diverse collection of deftly chiseled characters, Sergio de la Pava paints a grim portrait of the underbelly of USA, with many of its social injustices laid bare. The author’s passionate rage is steam that rises off the pages, evidenced early in the bitter irony of Jorge de Cervantes, a Colombian intellectual who came to the US seeking a better life, and then takes jobs as janitor, fast-food cook, taxi driver and parking attendant, working himself into an early grave in the hope that his children will benefit. The story unfolds through a complex interweaving of various and seemingly disparate storylines that at times leaves the reader stranded. The author expects his readers to follow the narrative jumps and various threads, yet pins us down with angry, if on some level apposite tirades. The scope of this lengthy novel is vast, encompassing not just American football, but also astrophysics, the New Testament and the healthcare system. Lost Empress has a strong masculine feel. The prose is relentlessly incisive, pointed and at times acidic. The pace is fast and intense. The reader may be forgiven for feeling somewhat pummeled by the end of it. There is little in Lost Empress that warrants the label ‘travel fiction’. I was certainly taken to New Jersey, to Rikers Island, but not for a holiday. Lost Empress blurs the lines between fact and fiction, Sergio de la Pava offering his readers absolutely no escape. Isobel is a prolific Australian novelist. She writes both contemporary/literary, thrillers and dark fiction. Follow her on Facebook, Twitter and via her website.